The direct and the inverse ‘scattering problems’ for the heat-conductivity operator\(LP = \partial _y - \partial _x^2 + u(x,y)\) are studied for the following class of potentials:u(x,y)=u o (x,y)+u1(x,y), whereu o (x,y) is a nonsingular real finite-gap potential andu1(x,y) decays sufficiently fast asx2+y2→∞. We show that the ‘scattering data’ for such potentials is the\(\bar \partial - \) data on the Riemann surface corresponding to the potentialu o (x,y). 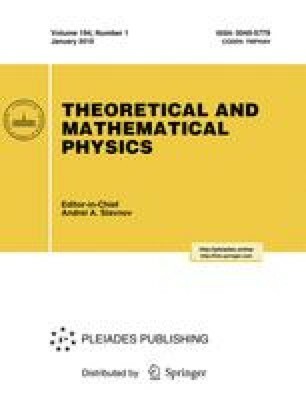 The ‘scattering data’ corresponding to real potentials is characterized and it is proved that the inverse problem corresponding to such data has a unique nonsingular solution without the ‘small norm’ assumption. Analogs of these results for the fixed negative energy scattering problem for the two-dimensional time-independent Schrödinger operator\(LP = - \partial _x^2 - \partial _y^2 + u(x,y)\) are obtained. L. D. Landau Institute for Theoretical Physics, Kosygina 2, GSP-1, Moscow 177940, Russia. E-mail: pgg@cpd.landau.free.net. Translated from Teoreticheskaya i Matematicheskaya Fizika, Vol. 99, No. 2, pp. 300–308, May, 1994.